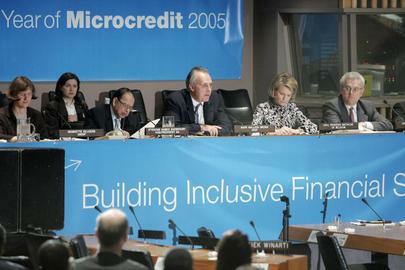 UNITED NATIONS, May 30 -- "Inclusive finance" is said to be a goal of the UN, one on which it partners with institutions such as Deutsche Bank, ABN Amro and Goldman Sachs. When asked, however, whether the UN screens these counterparties for how they treat low income consumers, project head Richard Weingarten said that at present this is not being done. As to how and where to deposit the UN's money is decided, Mr. Weingarten referred the question to the UN Development Program, which despite have a representative on the rostrum and having three of the four contacts lists on the project materials, has not come forward with any answers. This disconnection is pervasive at the UN. There was talk of micro-finance, simultaneous with awards to and partnering with institutions charged with predatory lending. Deutsche Bank, for example, has been under fire for the identity of the subprime lenders whose loans it securitizes, and for two subprime companies it purchased in the past year. Yet when Inner City Press asked Mr. Weingarten if Advisory Group members are screened, he responded that the part of Deutsche Bank that his project works with is concerned with micro-finance. But what about the rest of Deutsche Bank? Or of ABN Amro, whose logo is on the material distributed on Wednesday, and which is subject to hostile bids from Royal Bank of Scotland and Banco Santander, opposing a proposed merger with Barclays. If any of these buy the company, would they inherit a seat on this UN Capital Development Fund Advisory Group board? Inner City Press asked, and the answer was by no means clear. Video here, from Minute 30:43 to 36:08. Earlier on Wednesday, the UN Department of Economic and Social Affairs, DESA, sent a briefing to discuss the 21 page mid-year update to the agency's World Economic Situation and Prospects. DESA chief Jose Antonio Ocampo had been listed as the briefer, he knew that questions were waiting for him about the investigations surrounding DESA's Guido Bertucci. Perhaps for that reason, at the last minute -- still not reflected even in the UN web site's caption to the video of the briefing -- Mr. Ocampo was replaced by staffer Robert Vos, who has presented other reports. He talked through sixteen slides and then took a few questions. Inner City Press asked why DESA's diagnosis of the melt-down in the subprime lending industry differs from that of the International Monetary Fund, and more generally how DESA's analyses differ from the IMF's. Mr. Vos, who had earlier in the briefing referred to the need for democratization of voice and votes at the IMF, said that DESA uses up to 80 local contacts and is focused on developing countries. But it's an objective prediction, right? The answer was not at all clear. Video here. Also unclear is who ensures that components and sub-chieftains in the UN system provide answers. Mr. Ocampo can switch at the last moment, and no one says anything. UNDP can decline requests to come and provide briefings and answers, can ignore not only emailed questions but even those asked in the UN's briefing room, with the UN TV cameras rolling. Early on Wednesday, Inner City Press put questions including about the status of the audit of North Korea operations to a number of senior UNDP officials including the head of its communications office. After five on Wednesday, a UNDP staffer provide some information -- about Nepal, a question Inner City Press asked weeks ago. While the response, how ever belated and qualified, is still appreciated, how can UNDP with its five billion dollar budget not answer basic questions? We will have more on this.